This is the third of a series of events on movements of people in Southeast Asia entitled ASEAN People in Flux, which is organized by SEA Junction in collaboration with the Heinrich Boll Stiftung Southeast Asia. The series consisting of seven interrelated events aims to examine the complexity of intraregional mobility spurred by regionalization efforts and to discuss the policies governing it. In particular, by putting a spot on different kinds of people’s movements, the series highlights the double standards in the ASEAN’s approach to mobility. 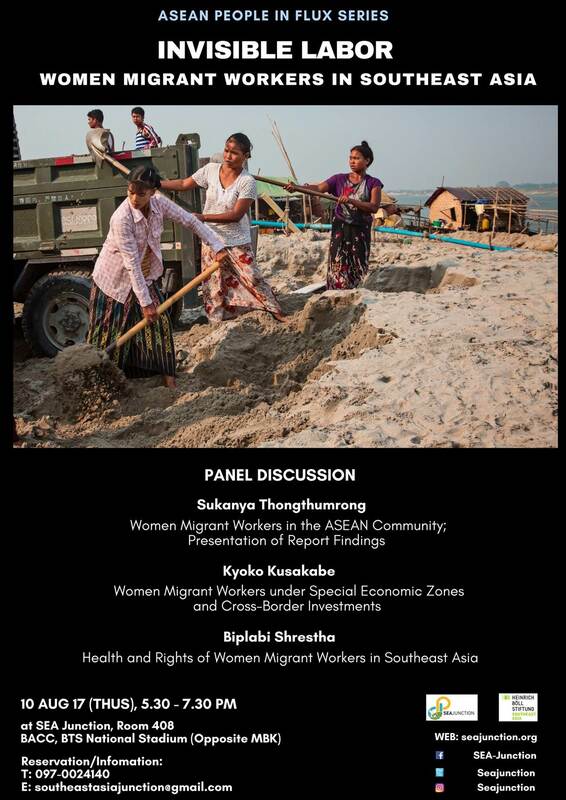 On one side, ASEAN promotes “people to people connectivity” by facilitating movements for business, study and tourism, while on the other side it limits migration of much needed “un-skilled” workers to exploitative contract labor schemes and it refuses to recognize refugees, asylum seekers and displaced persons. These double standards were clearly illustrated by the first event of the series on “refugee crisis in ASEAN” as contrasted to the booming industry of medical tourism discussed in the second event. This third event will present an additional dimension of policy discrimination from a gender perspective.